What a day! - Who said "Never again"? The Great River Race is the biggest and most prestigious event of its kind in Europe, acknowledged as the boating championship of Europe. London seen from The River Thames is always spectacular. Add to that the adrenaline, competing against more than 300 boats in what is effectively a waterborne marathon, the surge of the tide beneath the boat, the roar of the crowd... No wonder we keep coming back. This time, wet and cold conditions provided additional challenge. The "Cutty Sark", Greenwich Naval College, Maritime Museum, and Observatory (of GMT fame) combine to provide an inspiring backdrop whilst we launch Molly through the mud on the north shore at Poplar. A short pull up toward the start gives us time to warm up and settle into our places. A brief rest alongside a Thames Sailing barge delivers an unwelcome shower to some of us. Cast off; join the queue for the start. Chris N at the helm. "Number 239 move up" calls a marshal. That's us! Crowds cheer from the shore and from spectator boats. The start. All a blur. The river is quite wide here, and fairly choppy. It is easy to miss a stroke in the swell. Tower Bridge is still a long way off. Crew change; Paul to helm, Camille to rest in the bow. Crowds cheer; Tower Bridge at last. "Is that rain?" London Bridge, then rough water through the railway bridges. It's not rain, it's stair rods! Not so bad for the rowers, or Camille cowering under a yellow coat, but Paul, busy at the helm, can only get one arm into his... Sunshine! Rainbow! All happy again, but no time to relax. Keep pulling. Big Ben. The palaces of Westminster and Lambeth. Crew change; Bob to helm, Sue to rest. River less choppy now but still crowded with boats. Jostle to find a way around the slow ones. Victoria; Chelsea houseboats, Battersea Park and the old power station. The shore is a bit industrial now. Battersea helipad. Crew change; Andrea to helm, Chris R to the bow. Hurlingham Park, Putney bridge (a church at each end)! The cheering on the shore rises to a crescendo; spurs us to greater effort. - Oh it's only Fulham football club! Little do they know, the real sport is this side of the pitch. We're on the University boat race course! - They only row a fraction of what we're doing, and they are only 2 boats. Hammersmith bridge. Crew change; John to helm, Karolina to the bow. The long bend to port toward Chiswick Ait (eyot = islet). Chiswick bridge (end of the boat race course). We've done four crew changes; only one more. "Are we nearly there?" - Focus! Keep pulling! Kew rail bridge; narrow here and crowded again. Strand-on-the-Green; looks pretty. Kew bridge. Crew change. - The last one! Robin to helm; Tara takes a rest at last! Kew Gardens, Syon Park, aircraft roar overhead. In only 30 seconds they will have landed at Heathrow; we must pull-on for another 30 minutes! Isleworth, "The London Apprentice"; river seems narrow now. Try to find a way around slower boats. Cheering. Richmond weir, Richmond Bridge; "Are we nearly there yet?" Keep pulling! Marble Hill. A commentator's voice; what did he say? Bang! The cannon. "Are we there yet?" . "Next stroke - Easy all." Our three students, Camille Janson, Karolina Wruszczak and Tara Love deserve credit for exceptional sporting commitment outside of college hours. 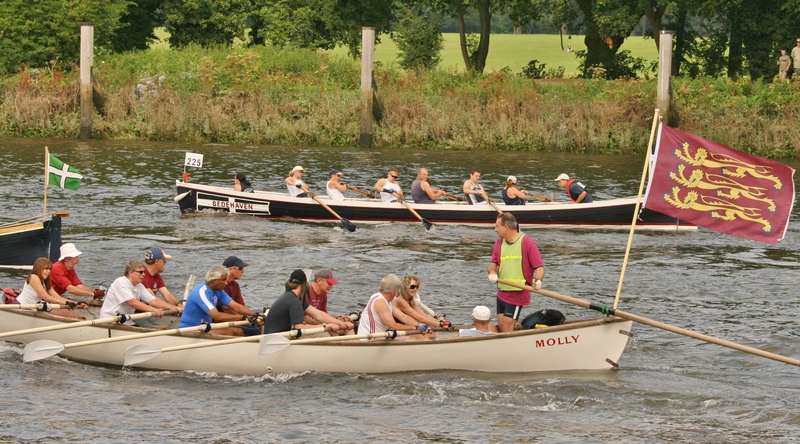 They had initially trained on "Molly" as part of The Henley College Enrichment programme, coached by Paul W. They then joined regular members of The Henley Whalers to train on Saturdays during the summer holidays and in early September. 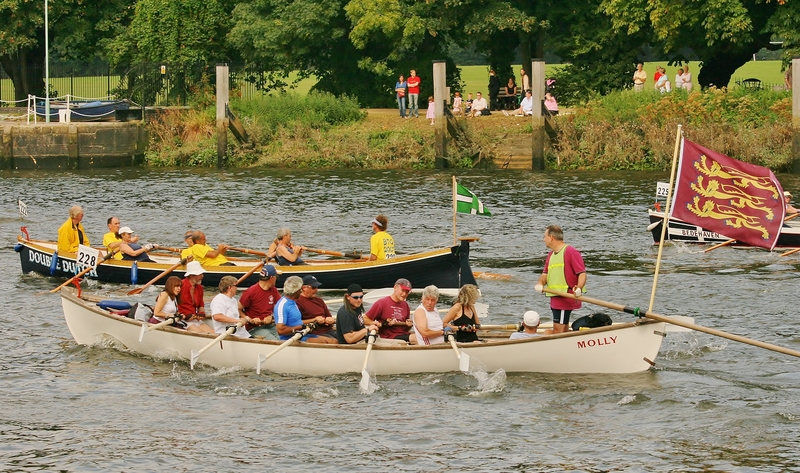 They contributed to an impressive result in a major international event, The Great River Race, involving over 2,000 competitors in more than 300 craft. "Molly" with her 12-strong crew completed the 20.9 miles from Greenwich to Richmond, through central London, in 2 hours 42 minutes 10 seconds. Average speed 7.7mph - Pretty impressive. Geoff, Molly's owner, was away this year. He sent these words in appreciation; "Congratulations to the Great River Racers. I've just seen the provisional results. The positions in class given by the GRR organisers is a strict over-the-line order of finish. Molly was thus the 9th whaler over the finish line. 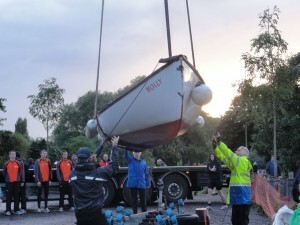 She was however 55th fastest boat overall, and the 3rd fastest whale boat in elapsed time. Great stuff and well done to all who took part". Close examination of the official Final Results sheet (note the tabs at the bottom for various categories) shows Molly started 239th (the handicapping never does us any favours) and finished 89th overall (=overtook 150 boats?). No mean achievement! 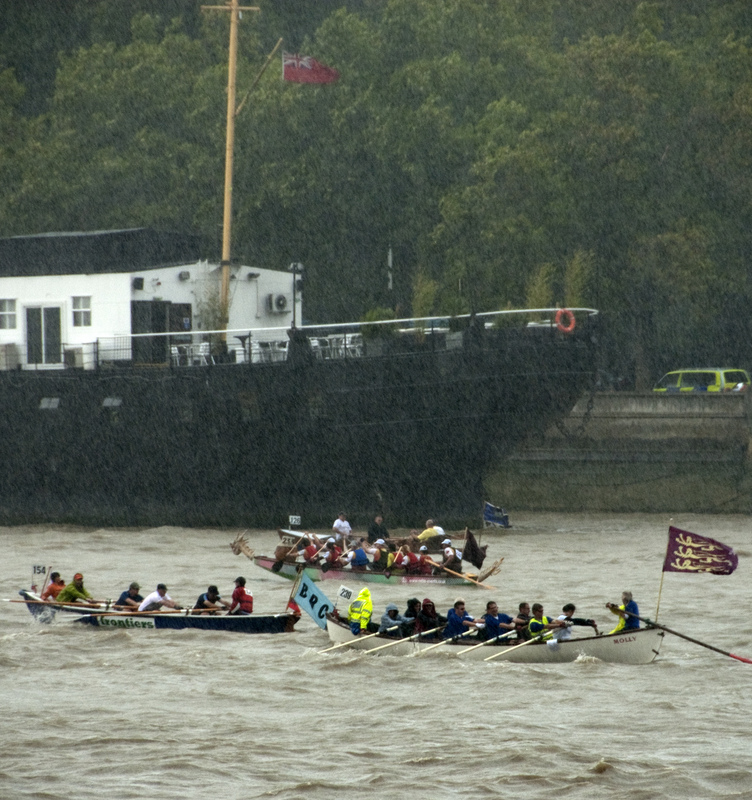 See the Great River Race website for other info. One learning-point - "Scheduled to start at 02:31:00; Started at 02:31:11"; Question - Did the 11 seconds cost us any places? Don't look; it might be upsetting. 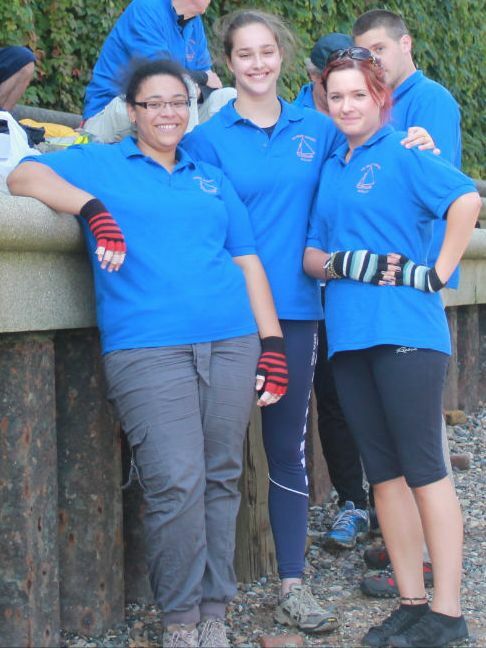 Sue (veteran of many GRRs) noted; "... the girls and the other team members and the support team were brilliant too. Although we have been much wetter in the bow we have never been rained on like that before. 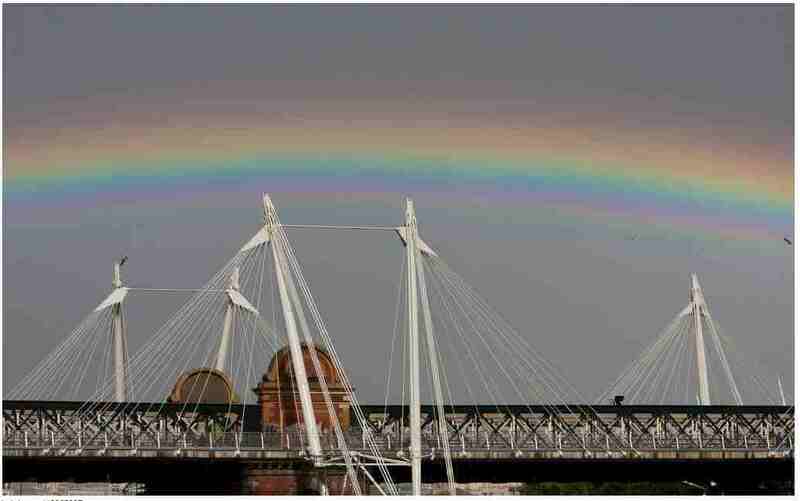 The rainbow was pretty fab though. Maybe that was our prize." Indeed, the "support team" (students' parents) deserve high praise for bringing the girls, for supporting us, and carrying our kit. Thanks also to Chris N and his wife, and to Robin for towing. Thanks to Karolina's mum for the plethora of pictures, and to Kathy Mansfield for her spectacular shot in the torrential rain. Steerers:- This year saw some of the best steering we have seen during our GRR races. Definitely a contributory factor to our progress. Another useful factor was the seat-change chart which clarified who was rowing, resting or steering at any moment, and exactly when the changes would take place, defined against landmarks on the shore. Our regular GRR-specific practices were another valuable innovation. Concentration, good humour, staying-power, commitment, dedication, and more, made GRR 2011 an event to remember.